Bring on the bold! Forget about limiting your wedding colors to only 50 shades of peach– consider any vibrant hue for your wedding day. The neon wedding is popular for this spring/summer and is another trend that can easily be personalized to your specific style. Add a funky flair for a more edgy vibe or incorporate tasteful pops of bright neon for a more sophisticated feel. Let your love shine bright with this vibrant inspiration. Invites Gorgeous invitations are the first step towards planning success. 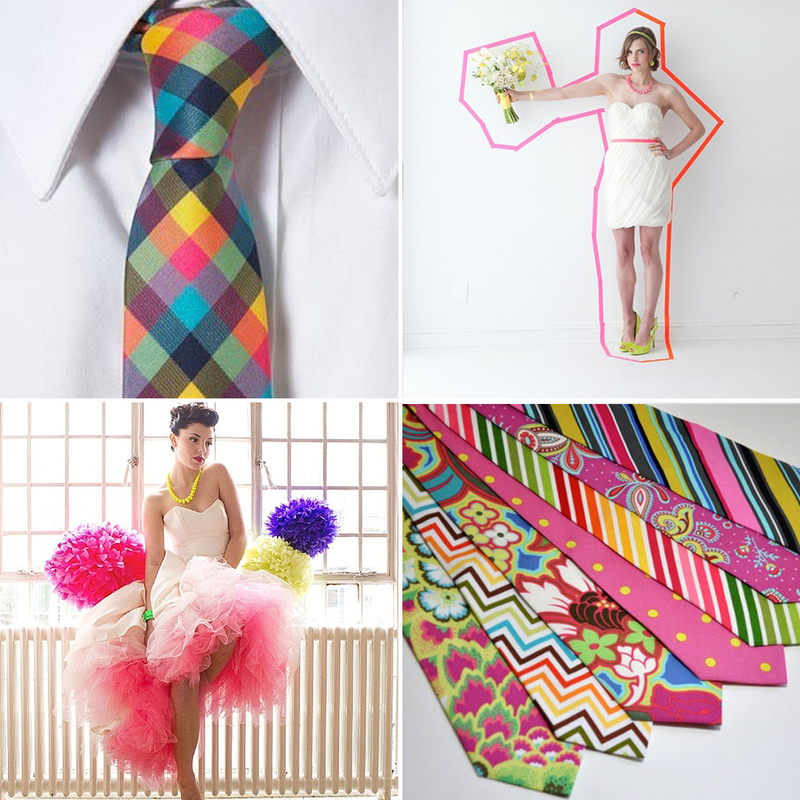 But don’t worry– a neon wedding doesn’t mean that you’re limited to only 80’s styles. 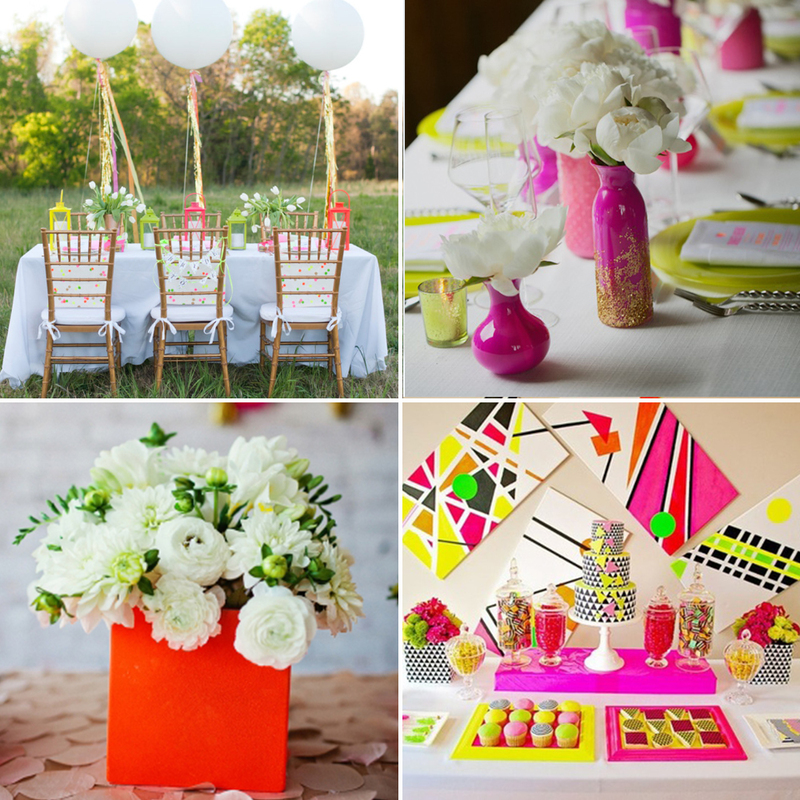 The neon wedding is so chic because of all of the options it offers. 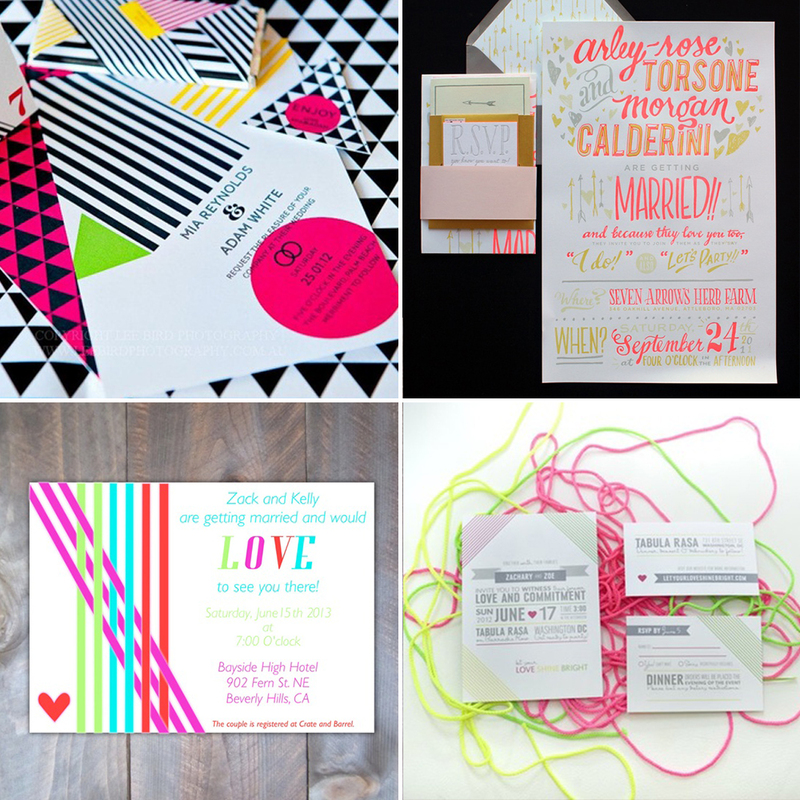 Let a touch of color shine against a white background or go for bold from the beginning with glowing stationary. 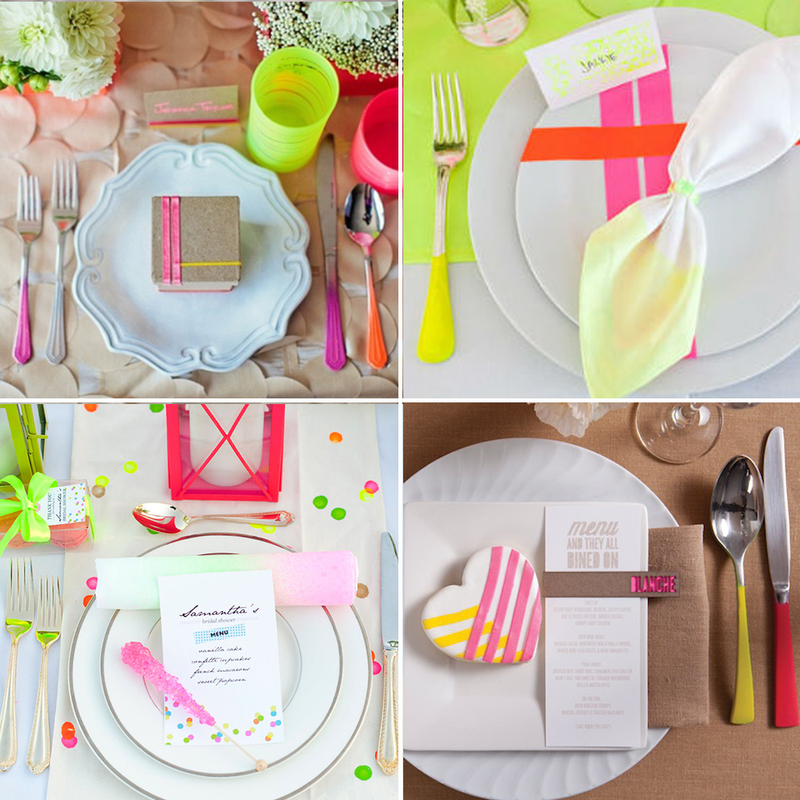 Seating Cards Another thing to love about neon nuptials–they look amazing with the washi and chalkboard trends! DIY– Recycle old keys for clever color-coded seating cards. This craft is perfect the bride looking for amazing results from an inexpensive and easy DIY. You only need washi tape, acrylic paint, and not a lot of time in order to pull off these amazing seating cards. Check out Limn & Lovely for a super easy how-to. 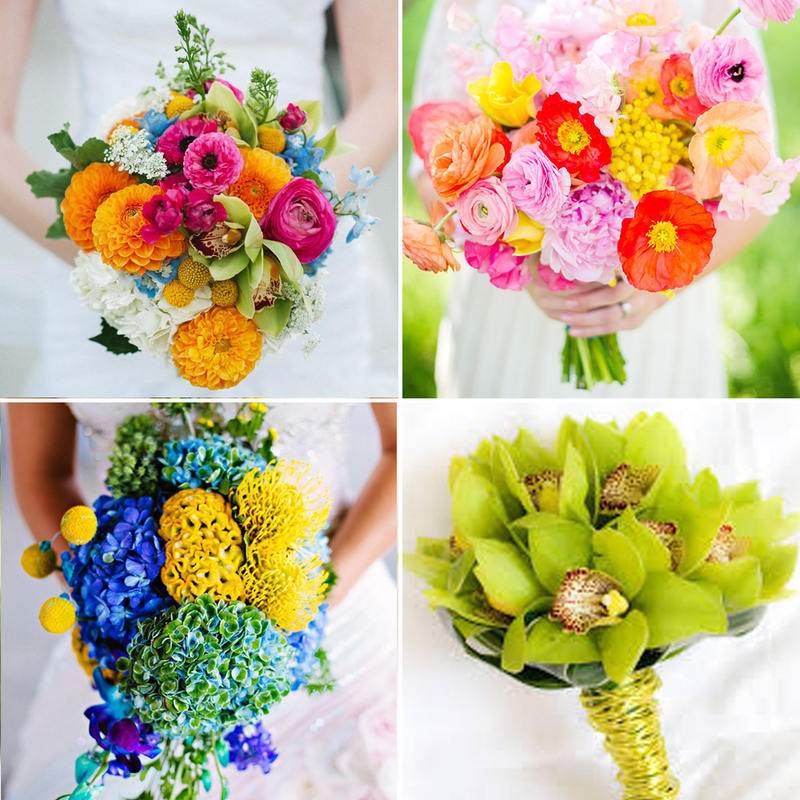 Bouquets Pick a bouquet to compliment your theme that showcases a variety of stunning colors or one that stays true to just a single bold hue. Be careful when considering which flowers to go with, you don’t want your bouquets to look lackluster against your electric decor. DIY Bottle Table Numbers- Collect old bottles all the same style or mix it up to add some variety. Use acrylic or spray paint to coat them in a beautiful neon shade. Ones the bottles have dried, add numbers with stickers or stencils. DIY Vases- Pick out any size cardboard tubes. Ensure with you florist that they size vase for your arrangements will fit within your tubes. Create patterns with washi tape to instantly have a chic centerpiece. With such a strong statement that a neon wedding makes, ensure sure that your style doesn’t seem muted in comparison. 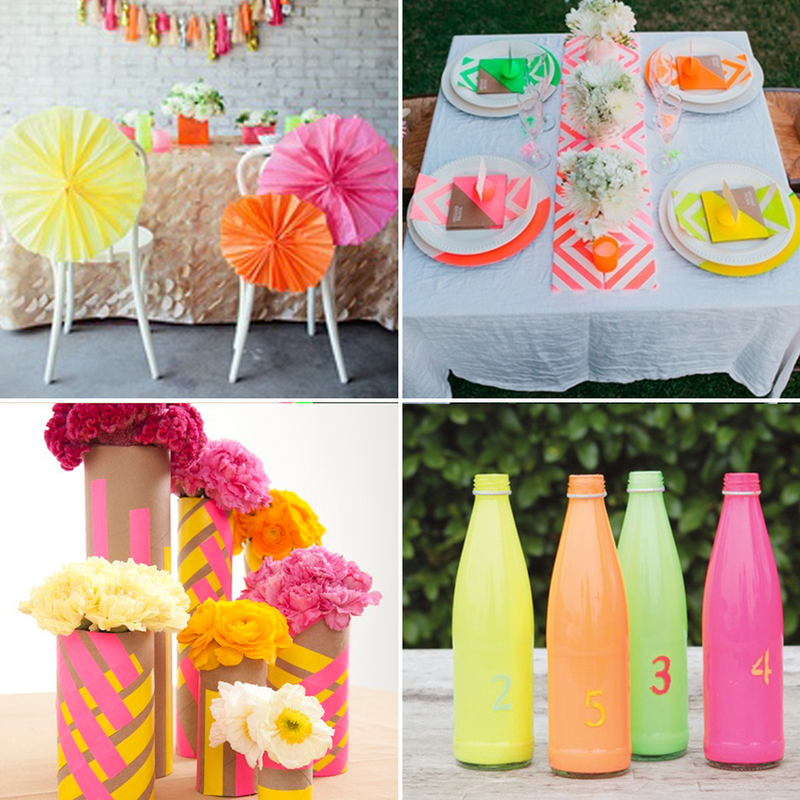 You and your bridal party don’t have to be decked out in all things neon in order to capture your trendy theme. J.Crew, Kate Spade, and Bauble Bar all have amazing statement necklaces that you’ll love both during and after your big day. If your groom wants to join in on the colorful fun, have the guys opt for bold ties or a pair of neon converse for their wedding look. Forget about the cream napkins your mother stressed about for her wedding. Liven up your place settings with vibrant favors or a sweet treat. A rock candy cocktail is the only thing missing from these tables! DIY Dipped Napkins– This process is easier than you may think and yields amazing results! All you need is Fluorescent fabric dye and white napkins. Any brand dye will work but iDye is easy to use and comes highly recommended. Check out Crate & Barrel or CB2 for some white napkin options (who knew you would have so many choices!). Reception Neon receptions can be as whimsical or as classic as you desire. Jumbo balloons with neon tassels perfectly suit a more playful affair while stunning floral arrangements in colorful vases complement any ballroom. Cakes Remember those white, frilly, wedding cakes? 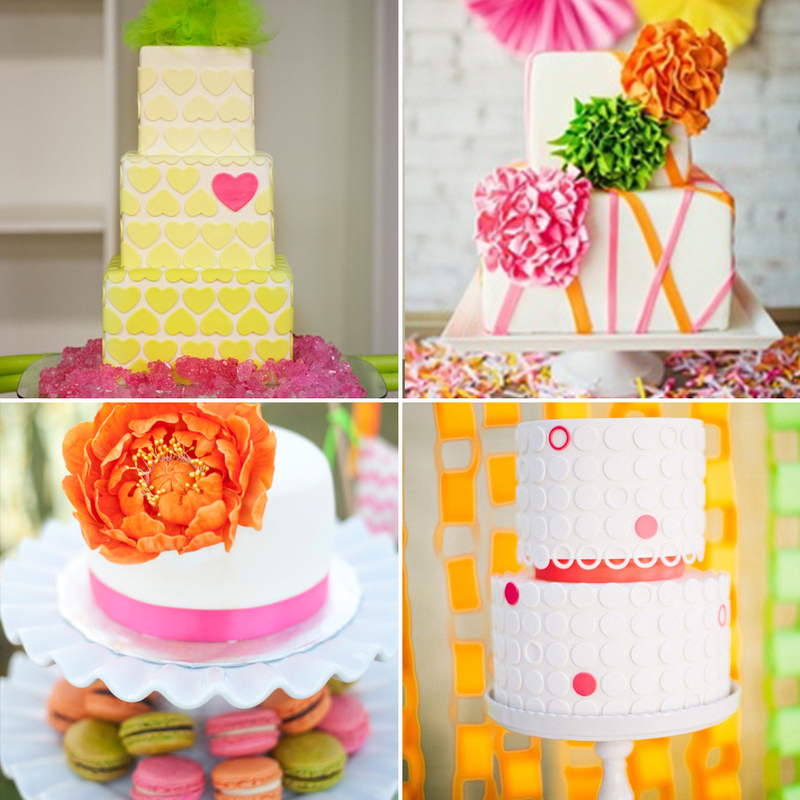 Bring some life to your dessert with pops of neon fondant or have the entire thing covered in bright accents. The possibilities for cake decor are endless so don’t be afraid to branch out and have it match your personality–and not just a white dress. Treats After spending an evening surrounded by big colors, your guests are bound to start craving some sweet treats. Candy bars are an easy yet eye-popping way to play up your color scheme yet please your guests at the same time. Order bulk amounts of colorful candy and your candy display can serve as both treats and decor. 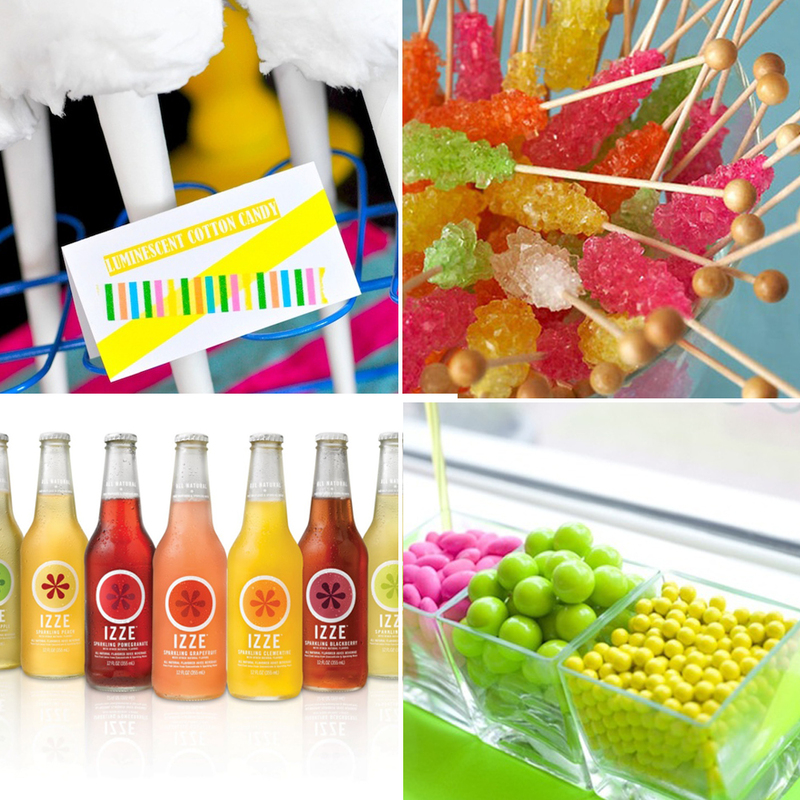 IZZE sparkling juice comes in a variety of bold colors and adds an extra neon touch four guests. Cases of 12 can be purchased from Sam’s Club. Favors While glow sticks, candy, or sunglasses may be the perfect favors for a neon wedding, it’s all about the packaging! DIY Favor Boxes- Select any size white cube box. Smitten on Paper has inexpensive glass finish 2x2x2 that ship in bulk. Select any style craft punch from your local craft store. We recommend Martha Stewart punches with the Smitten on Paper boxes for the perfect fit. 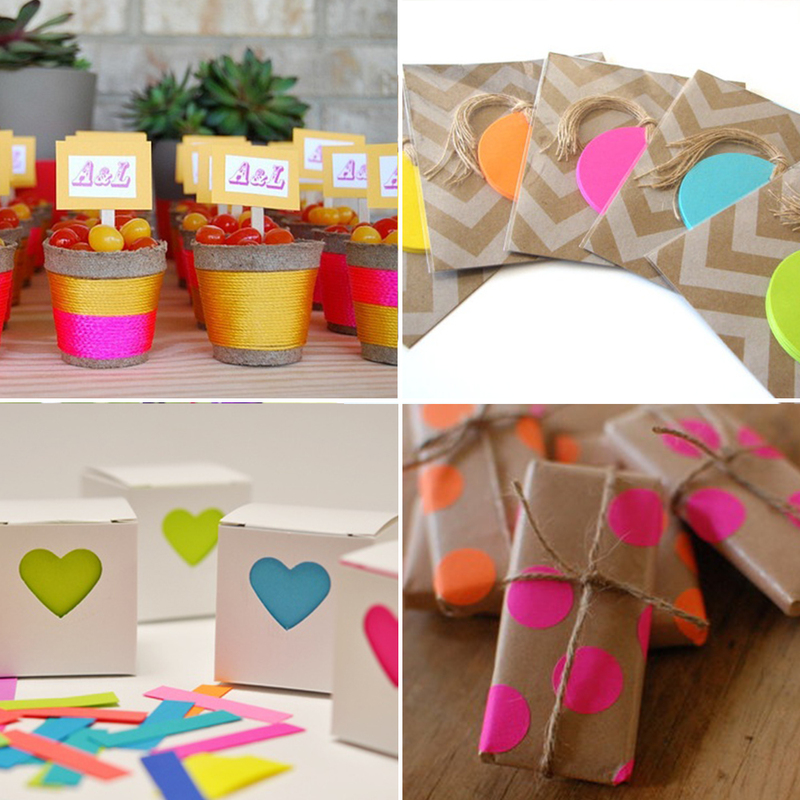 Assemble the boxes, punch the front, and slide in neon paper for adorable treats. 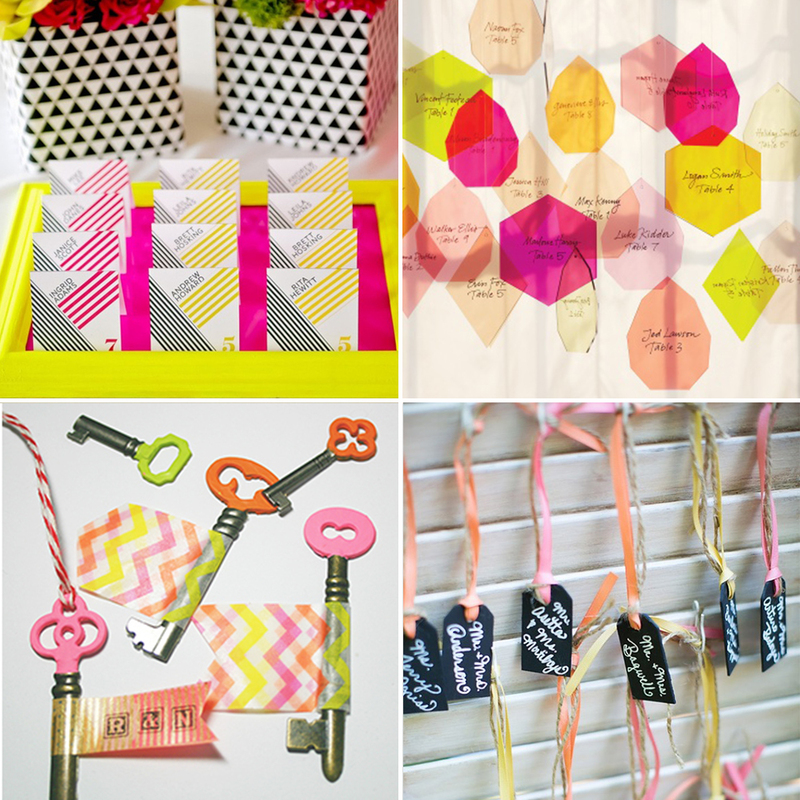 DIY Wrapped Favors- Customize the packaging of your favors by wrapping them with neon accents. All you need is brown package wrap (Paper Mart sells it in bulk), twine, and any bright dot stickers!